To our loyal readers from the last 7 years – I have been involved in a 6-month project that has kept me off this site. *EDIT – Don’t worry – it wasn’t health related, as a comment below very sweetly inquired about. Without boring you with any details, I had to concentrate all my time on it the last two months, and was unable to post. But it’s done – I’m back, and I hope never to be away from you and this site like that again! 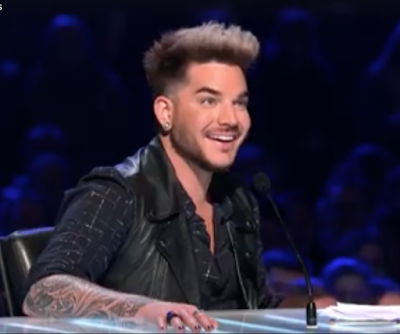 Let’s start with video highlights from Adam Lambert’s role as judge on X Factor – Australia. After viewing this, I realize how much I miss him and hope he’ll be back in front of American audiences soon (no insult intended to our international readers!). Yes, we have the long-awaited Rocky Horror Picture Show this Thursday, October 20th. And Adam’s tweeted he’s working on album #4 – YAY!! Also a tweet from Brian May that Queen + Adam Lambert are booking shows for 2017. Do we dare dream there will be a Part II of the North American tour? Thank you Cocoo Y for the following video. Love ya and missed ya so much!! Oct 11 2016 from Cocoo Y on Vimeo. Such an enjoyable,, fun video. I swear I could just listen to Adam simply talk all day. I absolutely love him, everything about him. Fell in ‘awe’ of Adam way back to AI and haven’t landed yet (& for the record, I will be 67 in January). He makes me feel young & free all over again. Glad you’re back Carol & thanks ever so MUCH for this wonderful video. You resurfaced beautifully. THANKS! Thanks so much for this video! The last time I saw Adam was last year at the Paramount in Huntington, NY! Can’t wait to see him in The Rocky Horror Show on Oct. 20th! Looking forward to album #4! Hope your time away was not for health reasons. Welcome back! No, thankfully it wasn’t health! Sorry, by being so brief I see how you could have wondered about that. I was in charge of a huge event with people coming from all over the country, with no committee. Nothing to do with Adam’s fans though! Thanks for sharing Carol. How can you not love this guy? He has it all actually more than all. Glad your back. Welcome back Carol! You were missed. I can’t wait to watch this video. Looking forward to Rocky Horror on Thursday. And I so hope Queen will come to the USA. This time I will go to more than two concerts. I will drive wherever. Glad you are back. Love seeing the updates here on Adam. Okay, that was good. Really, really good! He barely had time to warm up and it was still fantastic!